As all of you will be aware about the Gillette Federer Tour to Brazil starting in December. For all of you who need more information on the Gillette Federer tour and the dates & participants, see it here. So, in the build-up to the tour, Roger Federer's official Facebook page posted some pics (don't ask me, if these pics are photoshopped or not) :-). plus, we have seen pics of Roger Federer, so, no doubt,he is a complete all rounder (if speaking in cricketing terms) in the sporting arena . Fderer and the Brazilian outfit!!! 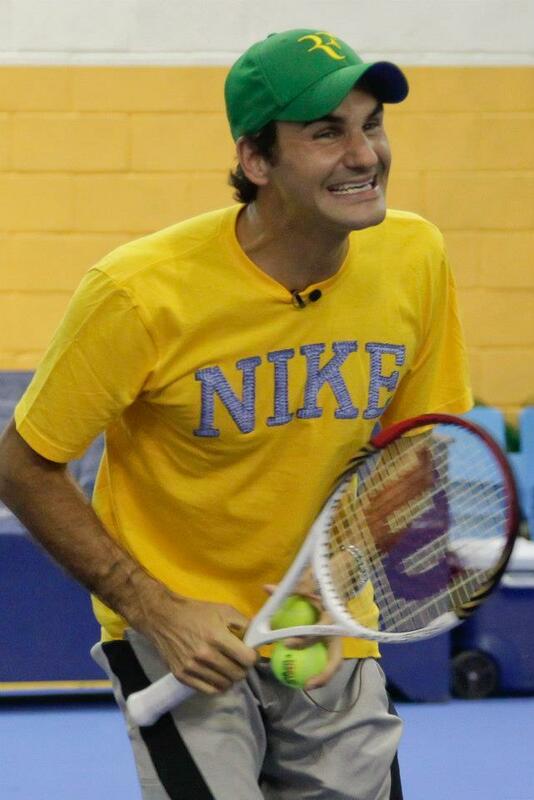 When I see the Brazilian outfit I'll be very happy, How if Federer worn it!! God bless Federinho. Roger Federer playing(yesterday,Wednesday) tennis with some kids from a poor neighborhood at Ibirapuera in Sao Paulo,Brazil..